Golf cart heaters not only take the chill out of the air, but can make an enclosed golf car toasty warm. 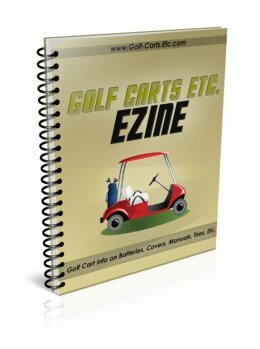 So whether you like to use your golf cart year round, play golf all winter, or have golf buddies like mine who want a tee time at 8:00 AM summer and winter, this is an essential golf cart accessory. In order to take advantage of the heat it is important to use this accessory with a your windshield up, your golf cart enclosure sides down and the zippers closed. 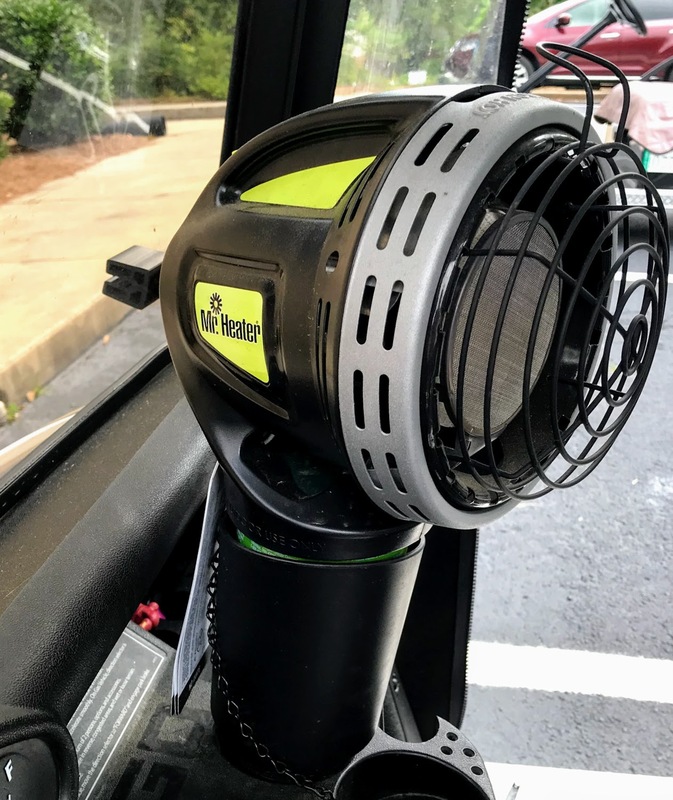 Depending on what type of heater you get, they can be placed in the cup holder, by the steering wheel and some are mounted on the golf cart roof. There are benefits and disadvantages to each of them. 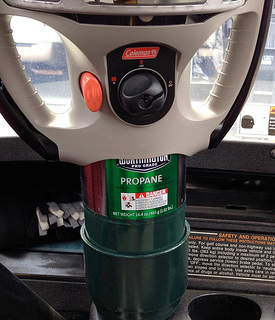 Propane golf cart heaters are the most commonly used heaters for several reasons. Propane heaters, such as the Coleman, requires no installation. Simply attach it to the propane cartridge and set it into a cup holder that is specially sized for the heater. The main issue, and it's different for every cart make, is for the heater/cartridge to remain secure in the cup holder. 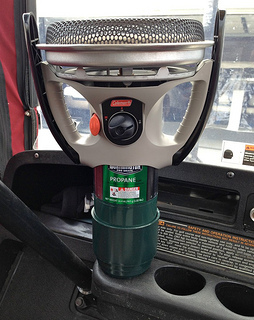 The Coleman one comes with a cup holder that adapts to fit securely most golf cart cup holders. A safety tip over switch turns off the heater if it tips over. It is battery ignited and one cartridge operates up to 5.5 hours. Depending on how frequently you use the heater, the cartridge needs to be replaced when it is used up. The Coleman heater features a low and high setting and a battery operated starter (cheaper and older models use matches to light them). Mr Heater connects to a one pound propane cylinder and operates up to 5.5 hours on one tank. Propane canisters can be purchased at most hardware stores, camping or sporting goods stores, etc. It uses a 16.4 oz propane bottle and has several safety features of - auto shot off valve for when the flame goes out and a steel reflector and safety grid. It should last about 8 hours on the low setting. Use a match or gun lighter to light the pilot to get it started. 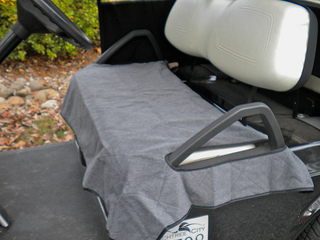 If you appreciate the heated seats in your car on a cold morning, you will love this golf cart seat warmer. There are other ways to keep warm in your golf cart besides using heaters. Combine a seat warmer with an enclosure and you can keep toasty without having to mess with propane or installing a heater. Warm up your seat before heading out on a chilly morning with Lava Buns. Put it in the microwave and place it on your golf cart seat for a couple of hours of warmth. The best part is that they can be used in the summer as well to keep you cool. No more buying propane cartridges or shut off heaters every time you hit a bump. There are other ways to keep warm on cold days if you don't want to invest in a heater. In the winter I always use our golf cart blanket - it has a warm flannel side that keeps the seat much warmer than sitting on a cold vinyl seat. It has been one of the best and most used accessories because in the summer months, I flip it to the other side that has a cool, cotton fabric so I don't sit on a sticky vinyl seat. Keeping warm with a few golf cart accessories, means your golf cart can be used more months out of the year with a more enjoyable, comfortable ride.